Luke Healy's graphic novel How to Survive in the North deals primarily with the ill-fated Karluk expedition. I'm pretty sure that I've read enough about northern exploration that I've come across this story before, but I must have forgotten most as none of it rang many bells. While Healy advises that he's tweaked facts and details to the point where he'd not be comfortable calling it non-fiction, he nonetheless presented at least a couple of characters in an intriguing enough way that I now plan to read more about them, namely: the captain Bob Bartlett and an Iñupiat woman named Ada Blackjack. As a teen in Newfoundland I recall being forced to read a biography of Bob Bartlett in high school and my only recollection is that I found it dull as dishwater. For Healy to spark my interest again is no small achievement. As for Ada Blackjack, I was not surprised to hear that after her ordeal with the Karluk, she's been the subject of much media interest. Her treatment, her survival, and the aftermath sound fascinating. 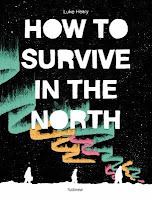 There's a subplot in How to Survive in the North, however, that I didn't find as successful. It involves a modern day professor in New Hampshire who is having a potentially career-ending affair with a student. It's not so much that this story isn't interesting it's that it's connection to northern story is loose at best. One of the morals Healy seems to make about the Karluk expedition is that northern exploration seemed exciting but required much preparation in order to survive. I'm guessing readers were also being given the same advice regarding love? Normally I don't like it when writers don't give readers credit to be able to figure out metaphors, but I did feel a little more assistance may have been needed here. The art is very Herge-esque (Tintin) which fits better for the adventures of the Karluk crew than for the New Hampshire story.